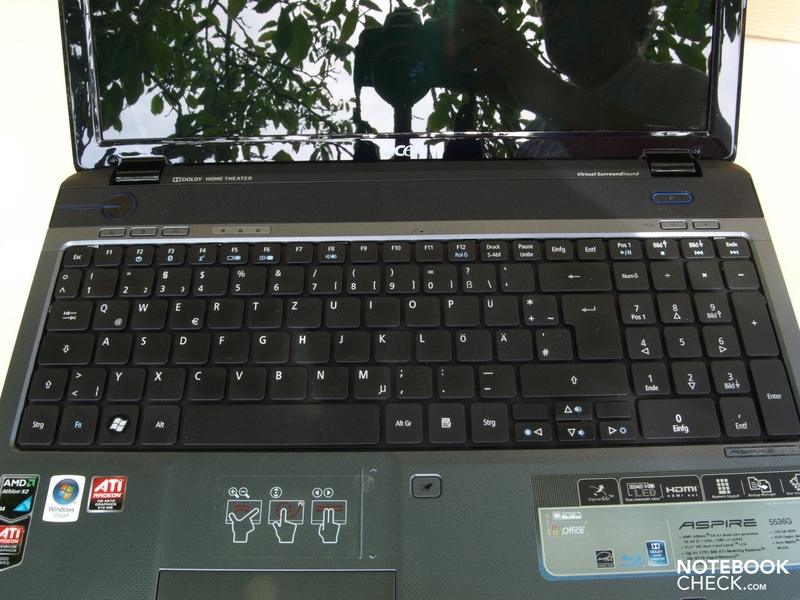 The Acer Aspire 5536G presents itself as fully orientated on multimedia. Therefore the glossy Acer CrystalBrite TFT monitor is tailored for the standard 16:9 cinematic format. A combination of a Realtek AL C888 soundcard and a Dolby optimized surround system with two built-in Acer 3DSonic stereo loudspeakers provide for a good sound. Equipped with an ATI Mobility Radeon HD 4570 graphic card and HDMI support, you can also enjoy movies on external monitors in full-HD. 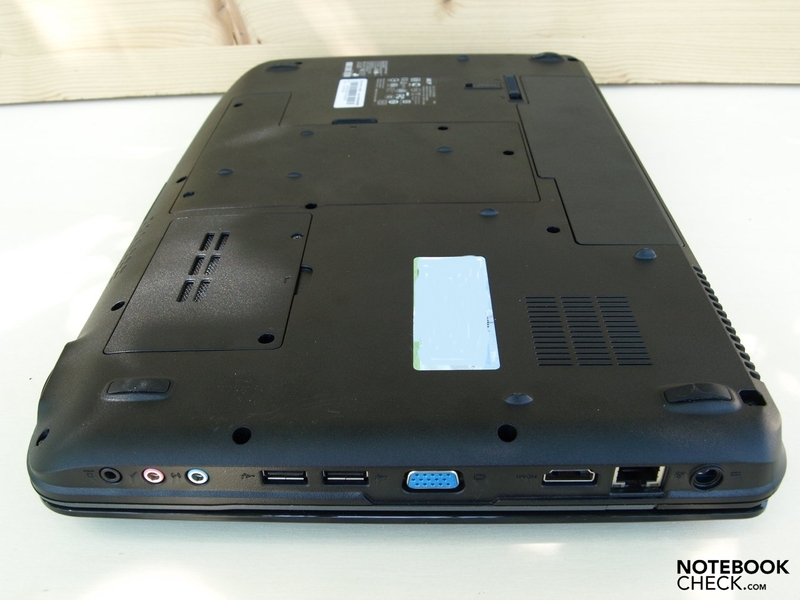 Note: There is also a whole row of configuration options available for the Aspire 5536G notebook, which differ in a few details. The tested model is the configuration variant with the model marking: 5536G-644G31Mn. Other configurations vary from this through the graphic solution or a BluRay disk option, for example. The case, which Safire Blue high-gloss display lid is a real eye-catcher, presents itself in the new Gemstone outfit of the Acer Aspire range. Especially voluminous LED lighting provide for creative highlights, particularly in the area of the on/off button. Above all the power button's LED performance is a bit too strident for our taste and also confusing because the visualization of the various operating modes (on/off, connected to main) are somewhat difficult to tell apart. For instance, it's not easy to establish if the power button has been pressed or not under power supply (the ring around the power connection lights up a bit). Although exclusively plastic components have been employed for the case, this makes a high-quality impression. Particularly the dark gray cover of the wrist rest is responsible for this, which have, apart from a pleasant haptic, also a good stability. Actually, the whole case shows itself, with a breadth of 383 millimeters, a depth of 250 millimeters and a maximum height of 37 millimeters, in a very compact chassis in a 15.6 inch format. This also puts a frequent carrying around away relatively well. We could only establish problems in the area of the optical drive in the test. At point pressure we could establish a slight giving in here. Likewise for the display lid, this gave in slightly under pressure and then also showed image distortions on the display. The display hinges almost appear to be somewhat under-dimensioned, but hold the test device's screen sufficiently in place, anyhow. These respond to an adjusting of the opening angle with an evident luffing. On the other hand, the hinges are fairly stiff so that a further opening of the lid is only possible using both hands. A limited display opening angle of approx. 135° was also evident, which shouldn't lead to restrictions at stationary utilization with the device. The notebook is secured for transport with two catches placed on the upper display frame, which are fixated on the base unit. The opening mechanism's counterpart, in the form of a central lever on the base unit, works perfectly but is rather difficult to reach due to the relatively large width of the notebook. 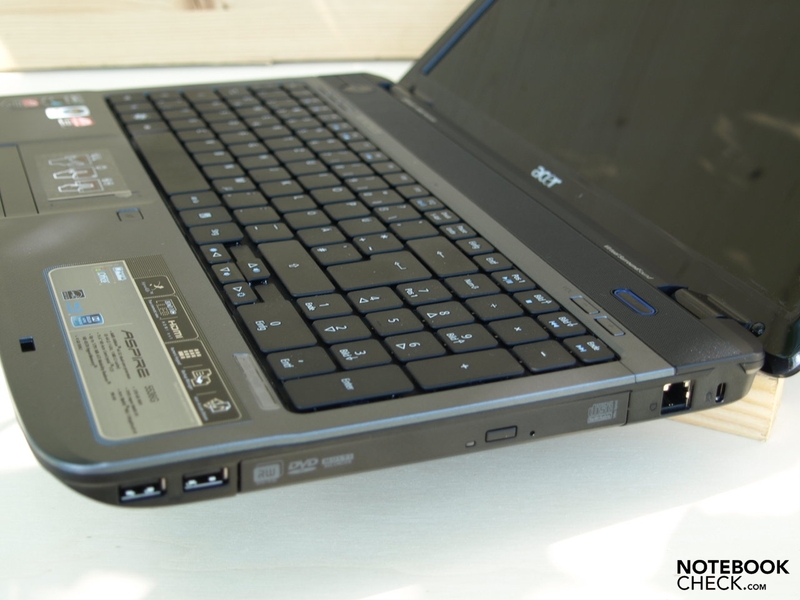 The Acer Aspire 5536G might not have an especially generous port configuration, but you do find everything you need for an undemanding office and gaming utilization on the notebook. To this count a total of four USB 2.0 ports, a LAN, a VGA and a HDMI port. In opposition to the manufacturer's information, the test device didn't have an Expresscard/54 slot. Once again, the placement quality of the ports is strongly dependent on the device's intended use. 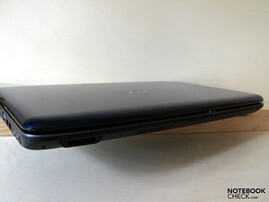 Righties have a definite advantage due to the placement of the optical drive on the right edge. However the double-blocked USB ports on the right side edge in the front area might prove to be disadvantageous at constant occupation. The left side edge accommodates the audio ports in the front area, followed by two further USB ports, the VGA connection, HDMI, LAN and power socket. There is merely a cardreader on the front side, which supports SD, MMC, MS, MS PRO and xD formats. Due to the beveled edge, the front doesn't bid any other interfaces. The back side has to stay free of any ports because of the opening mechanism. Only a louver is found here. The utilization of a larger battery isn't possible for the same reason, as it would restrict the opening angle too much. 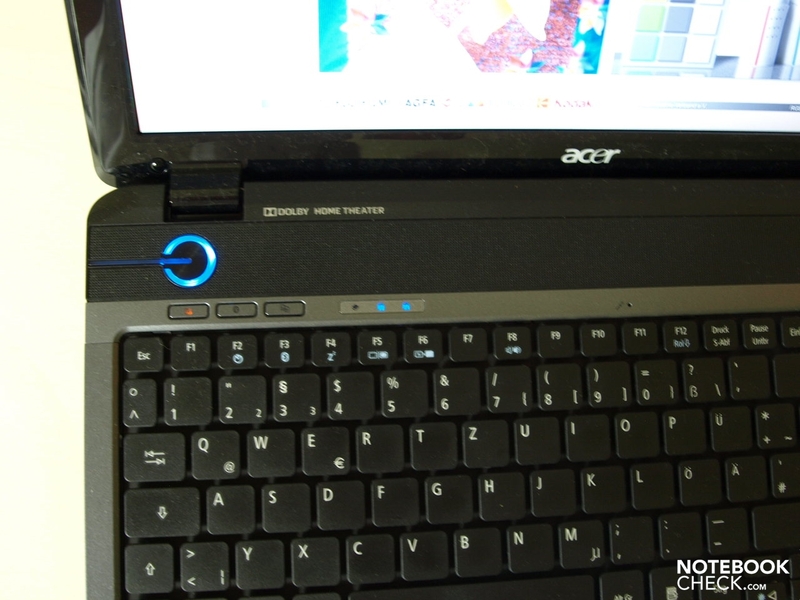 Hence, lefties will generally have their difficulties with the Acer Aspire 5536G at extensive port assignment. It's also obtrusive that the USB ports are placed very tight beside each other and beside neighboring devices and other connection possibilities. 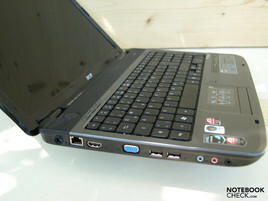 The Acer Aspire 5536G variations with an independent graphic card are also optionally available with a BluRay drive. 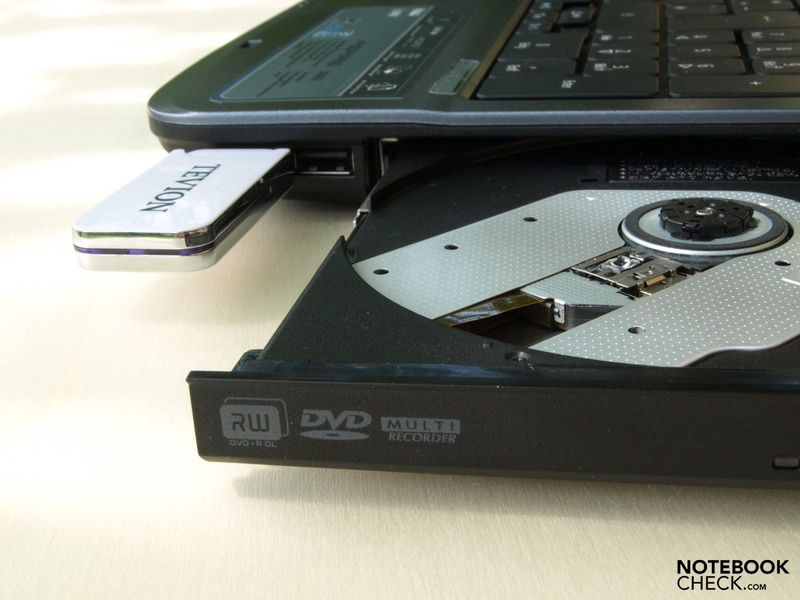 Our test model was merely equipped with an 8X DVD-Super multi double layer drive instead, though. 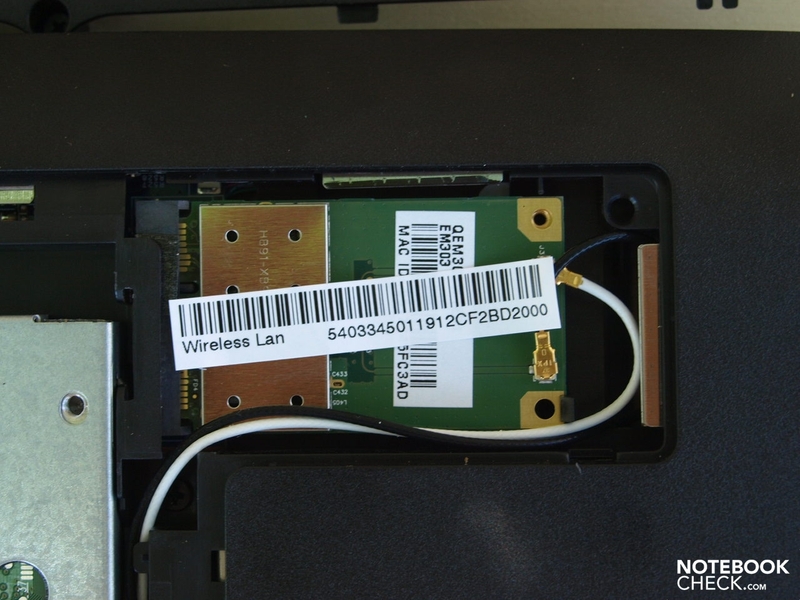 Aside from the ex-factory integrated NetLink Gigabit Ethernet adapter from Broadcom, which provides for a fast wired transmission with the according infrastructure, there is also an Atheros AR5B91 wireless module for quick wireless communication with draft-n support built-in. Bluetooth 2.0+EDR is is also available as a surcharge-liable option, but wasn't built into the test device. The integrated HDAUDIO Soft Data fax modem makes internet access via standard telephone lines. A UMTS modem is searched for in vain, though. 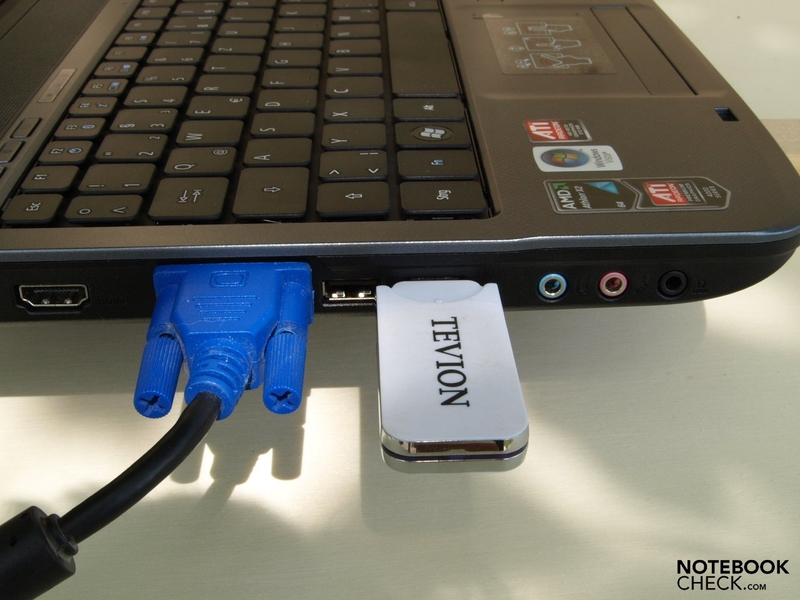 Due to the lack of an Expresscard slot, there is only the wireless broadband communication extended over an external USB modem left, if required. Nothing stands in the way of video conferences via the Crystal Eye WebCam built in over the upper display edge, the integrated internal microphone over the keyboard and the corresponding optional software. Vista Home Premium 32 Bit is preinstalled in regards to the operating system. Additionally a whole range of Vista versions and also XP is supported. Corresponding drivers are available for download on the manufacturer's site. At a configuration of more than 4 gigabytes RAM, you should definitely consider the selection of a 64 bit capable operating system so that the whole memory can be used under Windows. There were four gigabytes of main memory built-in in the installed system. However, there is only a bit over 3 gigabytes available for applications since a part is reserved for the operating system and for installed devices (Memory Mapped IO). 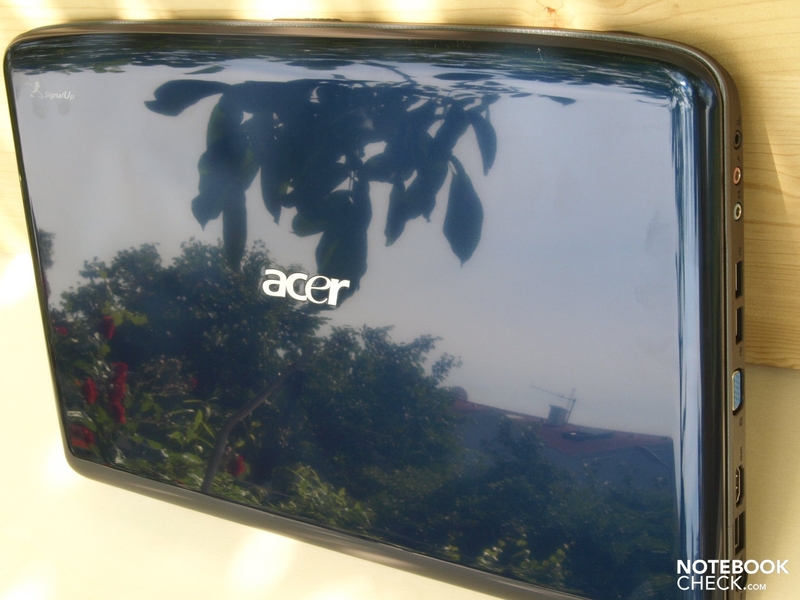 Acer grants a 24 month guaranty including 1 year International Traveler's Warranty ex-factory on the Aspire 5536G. Fortunately, the keyboard shows a standard layout with separate numerical block. There aren't any irregularities in regards to the size of the given alphanumeric keys. These are slightly reduced to the benefit of the additional numerical block with a width of 16 millimeters and a depth of 16 millimeters. The built-in keyboard turned out to be very pleasant at typing texts. All keys were hit immediately and the type feel was also alright. This can be described as having a rather soft stroke and a slightly resilient stop. 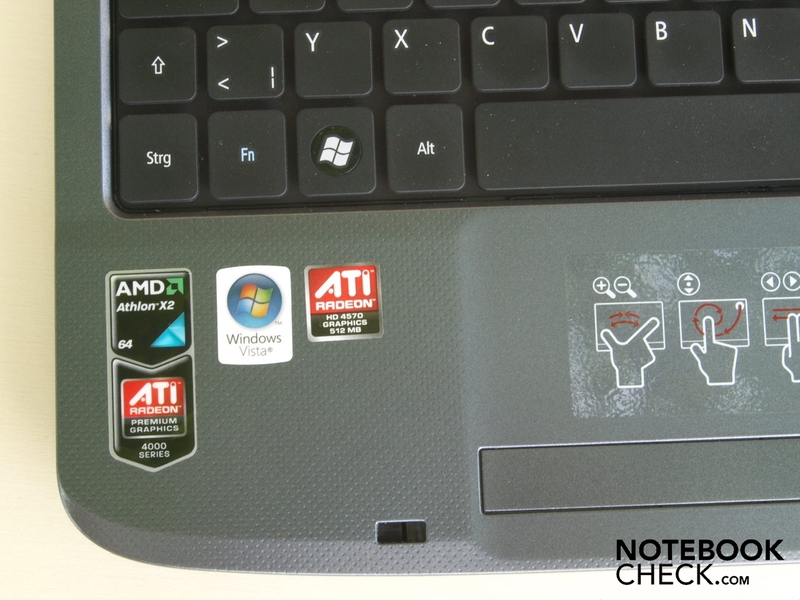 Even the only discreet clicking noise of the keys could please in the test. The touchpad turns out comparatively large and is seamlessly integrated into the surrounding case. It confines itself merely through a beveled edge haptically and optically. This touchpad supports a few multi-touch features for zooming and scrolling. Although it needs a bit of getting used to in the beginning, in the end it works perfectly. An optically as well as haptically marked vertical scroll field is also existent. Even the pad's gliding traits are alright and make uncomplicated navigation possible with the pad. The touchpad keys present themselves as not quite as convincing, these having been designed as one single long key. Therefore it's not obvious where the left mouse key ends and the right one starts, not to mention the dead zone between them and you often hit exactly this. The keys' type feel turns out a bit awkward, letting themselves only be pressed with much effort close to the dead zone whilst they respond especially easily at the edge areas. Also not particularly elegant is the cracking sound, which the keys emit. 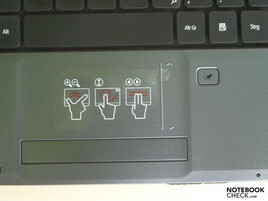 Thanks to an own, directly beside the touchpad placed button, this can also be deactivated quickly, if required. All remaining hot keys are to be found over the keyboard. 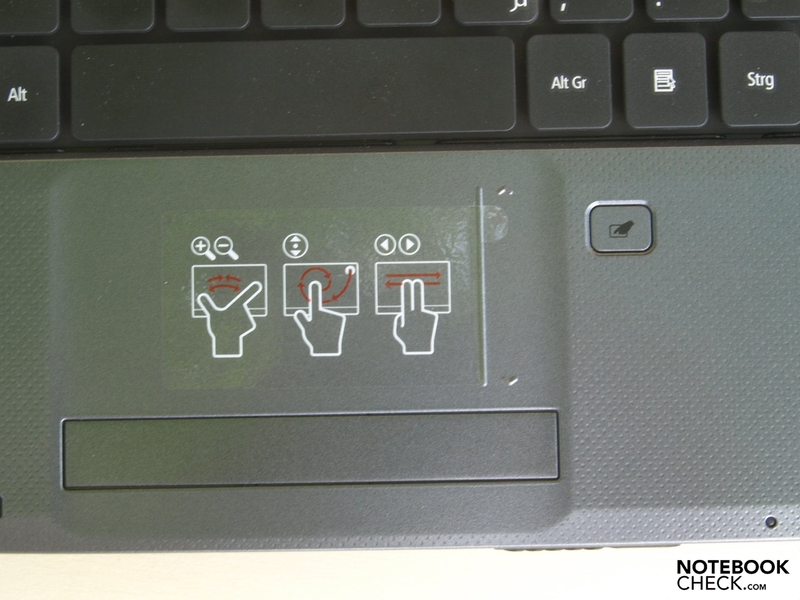 The Acer Aspire has hot keys on the left for the control of wireless LAN, Bluetooth and the start of Acer's Backup Manager. Immediately following are the status LEDs for the hard disk, NumLock and CapsLock. On the right both keys lettered with "-" and "+" make it possible to regulate the volume to a lower, respectively a higher level. 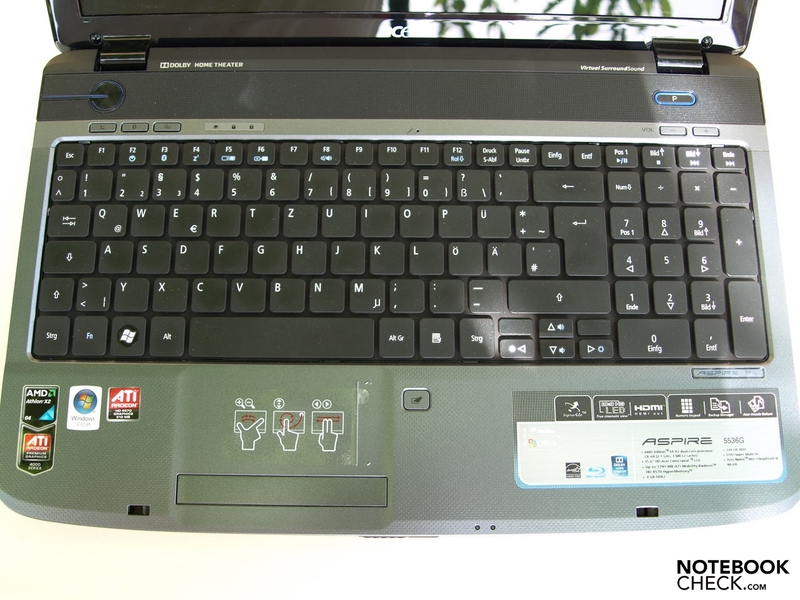 A special feature of the Aspire 5536G is a key which can be programmed by the user, which is also found in the right area over the keyboard, directly over both loudspeakers. A predefined program can be started by the user with a touch of the key. 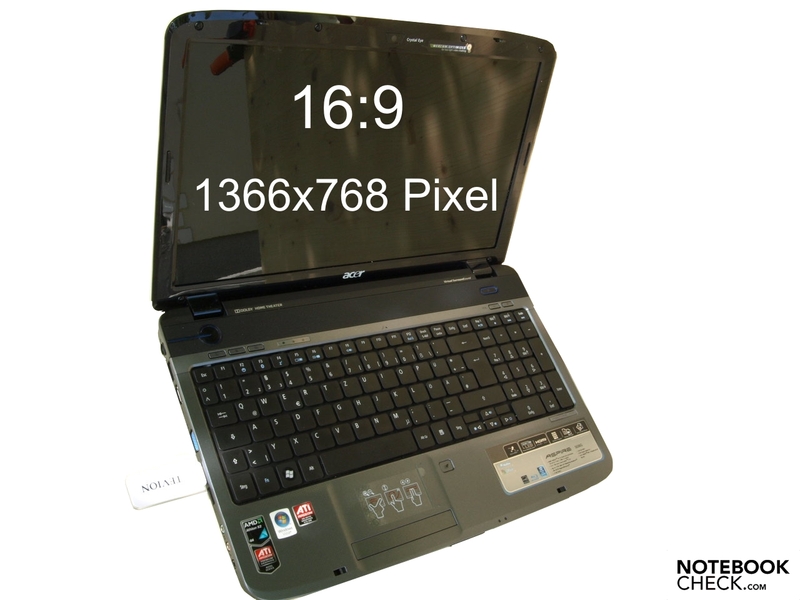 The Acer Aspire 5536G follows a new trend in respect to the applied display format. In the opinion of media enterprises, the aspect ratio of 16:9 should also converge with notebooks, in order to render contemporary movies as bar-free as possible and to use the display to its maximum. At this point you shouldn't forget that we are still dealing with a mobile PC, for which only a small part of its application field is taken up from playing movies. For many daily tasks and multimedia applications, a correlating image height is very much of an advantage. Then we are at the given notebook resolution of 1366x768 pixels, In assessment to the common 1280x800 format, somewhat of height has been saved and invested into the image width, instead. The HD Acer CineCrystal LCD built into our test device showed a good maximum brightness of 217 cd/m2 in the brightness test, measured in the center display area. However a strong brightness decrease towards the lower left section could also be observed, where the maximum brightness was merely 164.2 cd/m2. 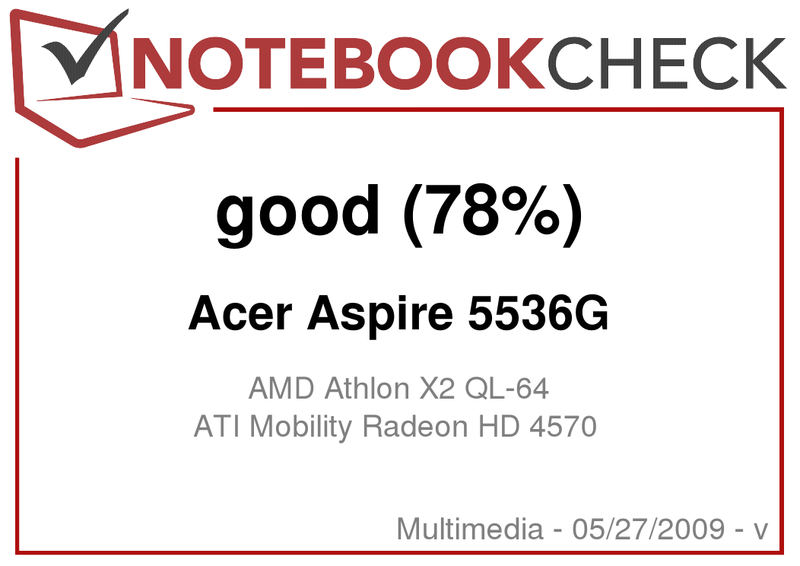 The Aspire 5536G achieved, in regards to illumination, merely 76% with this. The maximum given contrast of the built-in screen reached a ratio of 174:1, which is still a relatively acceptable value. Subjectively, the color representation doesn't show any irregularities, but there is a brightness decrease downwards on a white background which is visible with the naked eye. 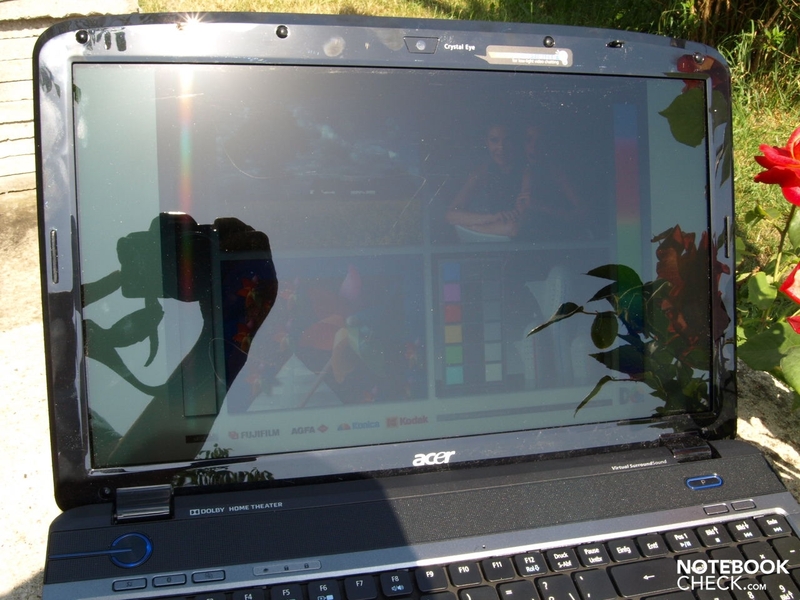 The display with a reflective surface is alright at predominant indoor notebook use. The reflections can lead to a quick tiring of the eye due to adverse light incidence also indoors at a permanent working place. If you are often exposed to adverse bright surrounding light conditions, as it is the case outdoors, you have to count with highly disturbing reflections. 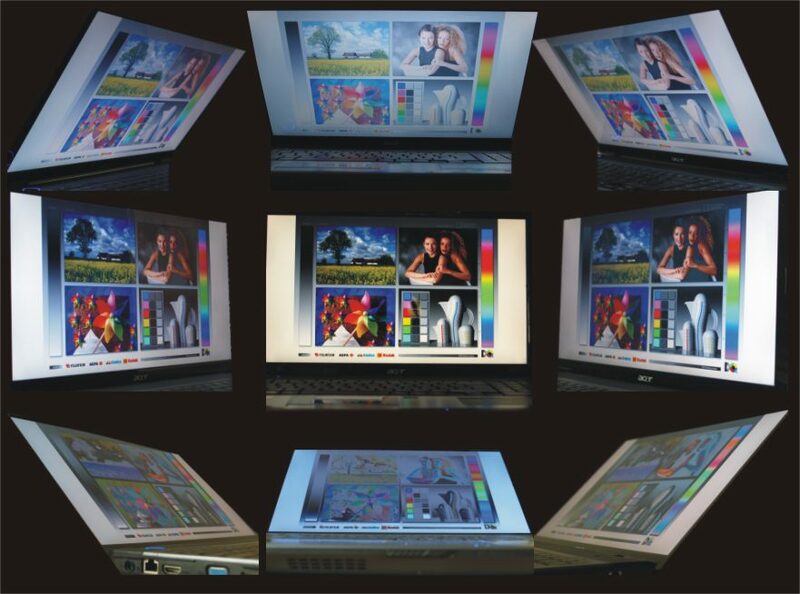 The viewing angle stability in the vertical viewing field is, as for many notebook displays common, rather restricted. Already slight deviations from the ideal perpendicular viewing angle have an obvious image distortion as a consequence. The display shows itself as much more tolerable in the horizontal area and allows also inclined viewing angles. But unwanted reflections increase here, as well. 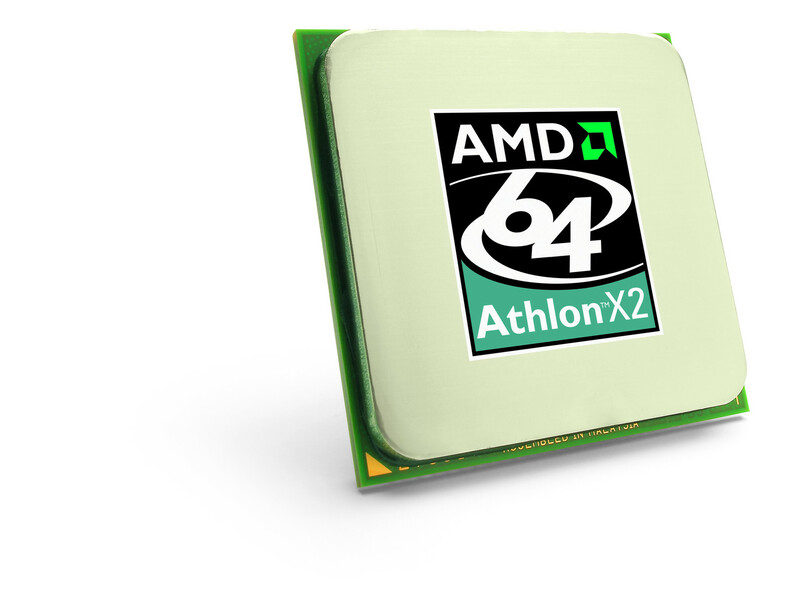 Based on AMD's M780G chip set, a whole range of AMD Turion X2 dual core processors or AMD Athlon 64 X2 dual core CPUs can be employed in the Acer Aspire 5536G. The AMD processors are somewhat behind those equally clocked chips from Intel, in regards to performance but this is not so significant for undemanding applications. 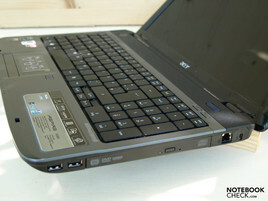 Particularly the price plays an important role, especially for multimedia starter notebooks and AMD is the leader here. 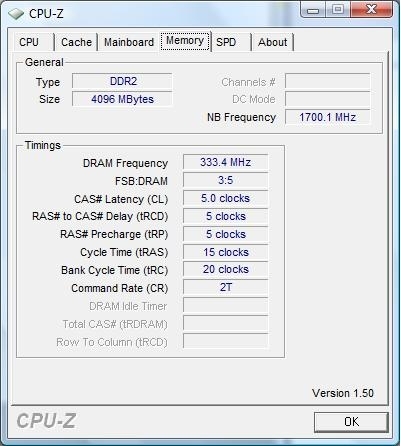 Our test device was equipped with an AMD Athlon X2 QL-64 with a clock-rate of 2.1 GHz per core, in this regard. One significant difference to Intel's chips is the smaller L2 cache of 512 KB per core due to its architecture. The QL-64 is manufactured in the 65 nanometer technology and correlates in this regard to the older Merom CPUs from Intel. 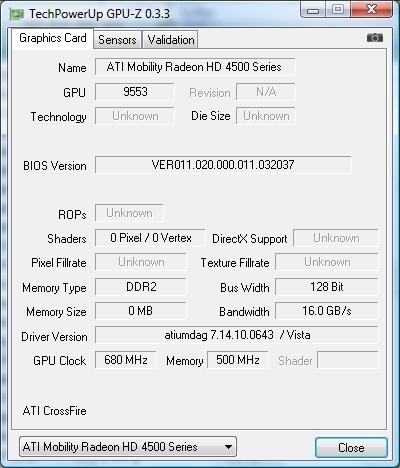 A Mobility Radeon HD 4570 from ATI comes to use for graphic computing, a DirectX10.1 capable starter middle class graphic card for notebooks. This independent graphic card with a 64 bit memory bus, is available with various memory configurations, (GDDR3, DDR2, or DDR3). 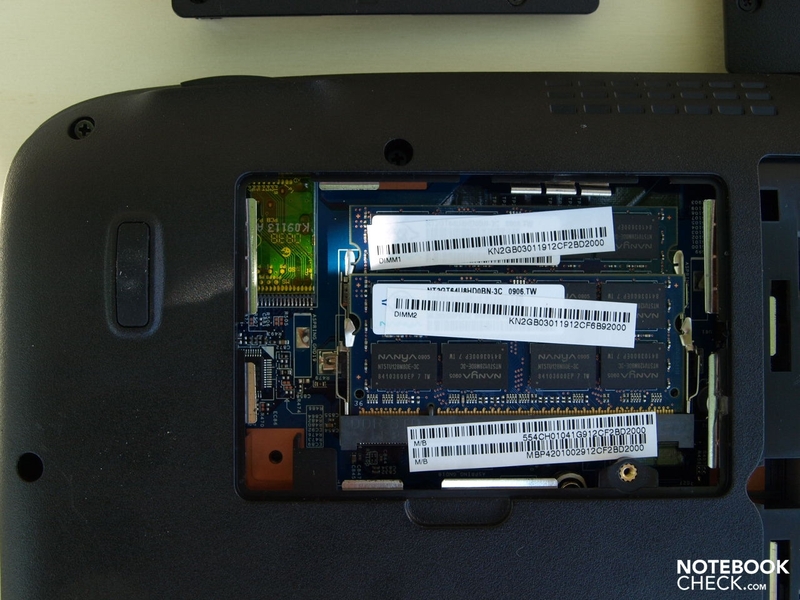 The one in the test device was fitted with a DDR2 memory. Hence, the cheapest solution was selected. A GDDR memory with a 32 bit bus would be faster than a DDR memory with a 16 bit connection, but is also considerably more expensive in retail. Note: The GPU-Z screenshot incorrectly indicates a 128 bit memory bus for this graphic card. According to the manufacturer it is a 64 bit connection, though. This can also be confirmed by Lavalys' Everest Report. 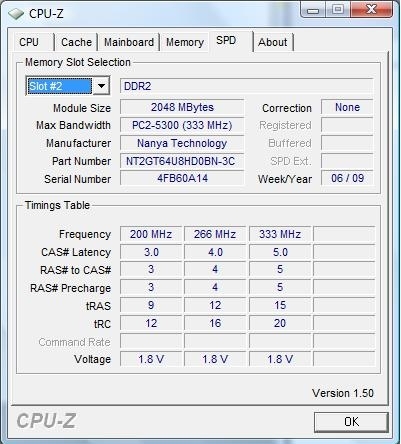 The Everest Report correlates with the manufacturer's information, while the GPU-Z wrongly indicates a 128 bit memory bus. The application performance is corresponding to that of a multimedia starter device at a low price. 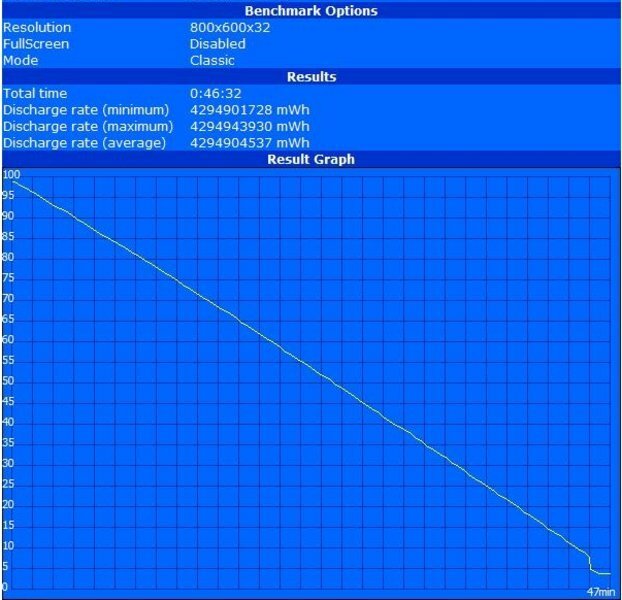 With the reached 4270 PCMarks in the PCMark05, it even exceeds the, in the beginning of the year tested, Acer Aspire 5530G (3805 PCMarks) by about 11%. However, other multimedia devices reached similar values already two and a half years ago, though. 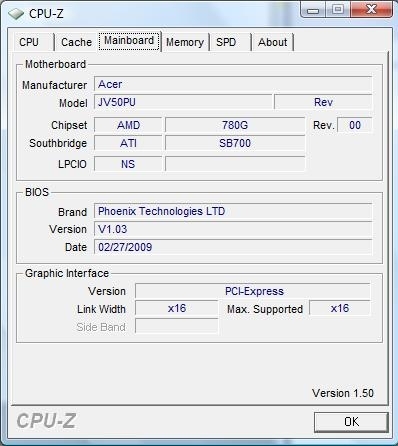 An example would be to name the Asus F3Jm, which was tested by us in October 2006, and achieved a comparable performance with 4281 PCMarks, although to a considerably higher price then. 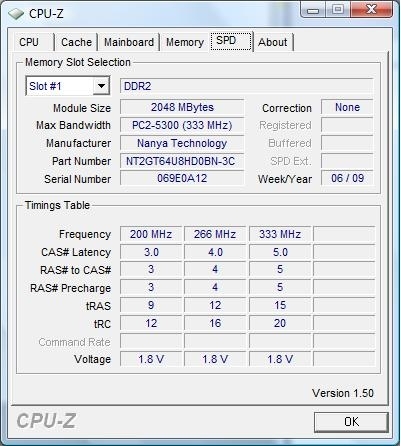 The HD 4570 reached 2654 points in the executed 3DMark2006. It places itself between the 9600M GS and the 9600 GT, with that. The use of a GDDR memory instead of a "normal" DDR2 RAM as a graphic memory would most certainly increase the performance a bit. 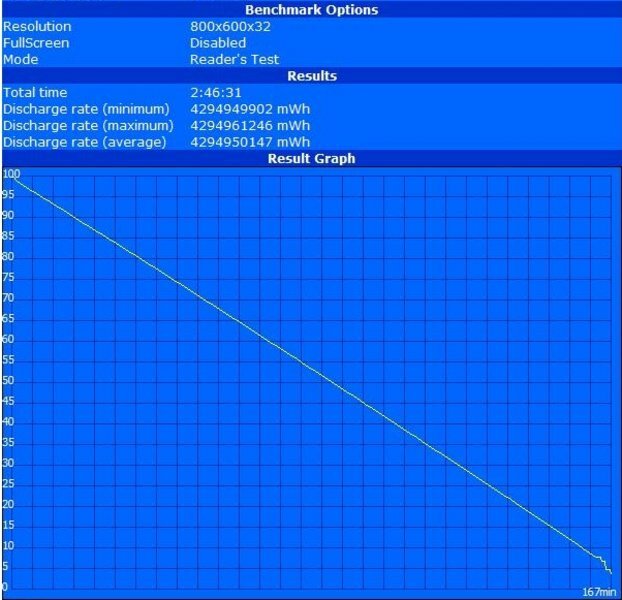 Then again, in comparison to the Aspire 5530G (2327 points), which can improve its graphic efficiency via a hybrid graphic solution at best up to 20%, a performance bonus of 12% for our test device in the 3DMark2006 benchmark, is to be noted. You can observe an considerable improvement from the HD 3400 series to the HD 4500 series here and in the Cinebench R10 Shading test (+19% for our test candidate - 2598; 5530G: 2098). Of course, the configuration of the main memory and the mass memory contribute to the performance of the total system. 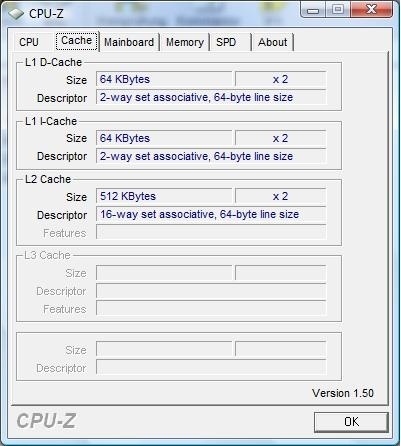 With a total main memory capacity of four gigabytes RAM, the system bids also the maximum of a 32 Bit operating system addressable RAM capacity. However, merely a bit more than three gigabytes are available for applications under Windows Vista Home Premium 32 Bits. The rest is reserved from the operating system for itself and for Memory Mapped IO. If you are considering upgrading this device up to 8 gigabytes RAM, a 64 Bit operating system is definitely necessary. With this, you would also reach the mainboard's maximum supported capacity. Upgrading is easy, due to the easily accessible maintenance opening, but at least one of the built-in two gigabyte modules will be obsolete. 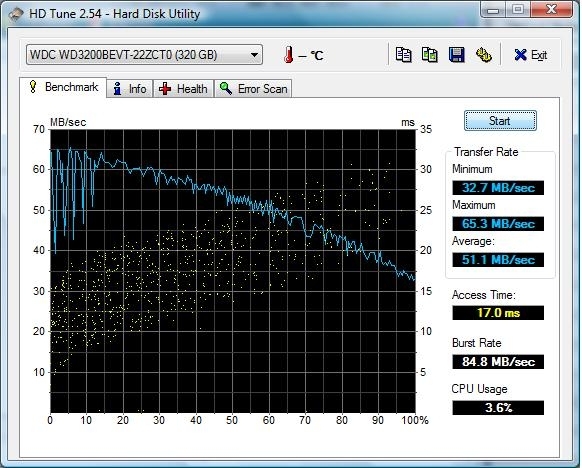 A voluminous 320GB hard disk from Western Digital (WD3200BEVT) is employed as the mass memory. The 2.5 inch format data carrier runs with a velocity of 5400 rpm and shows adequate access times of 17 milliseconds and transmission rates of up to 65.3 MB/s in the HDTune benchmark test and is therefore in the center span of comparable 5400 models. 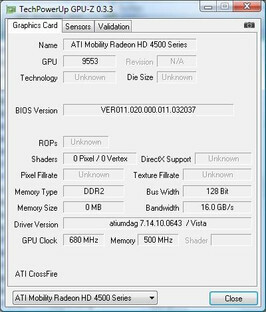 Even though it's been conceived as a starter multimedia device and not as a gaming notebook, we did want to take a closer look at the gaming capability of the Mobility Radeon HD 4570. 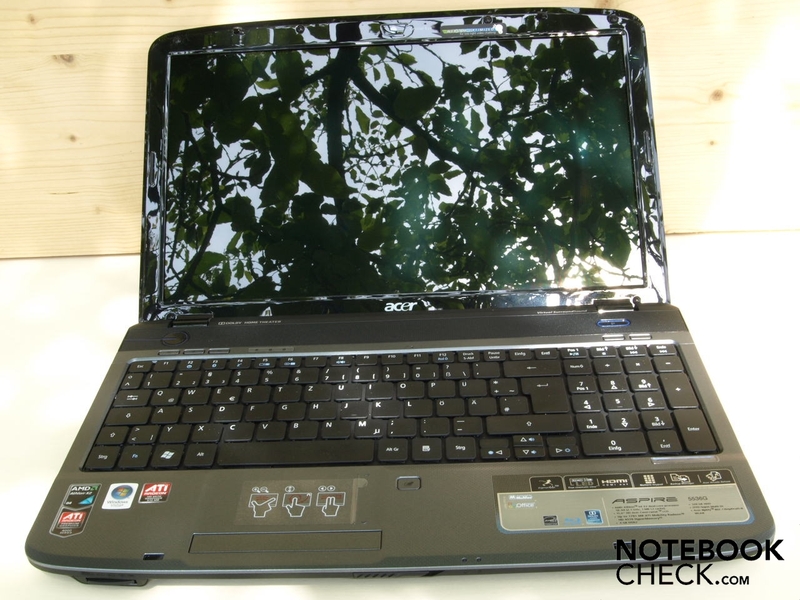 Older titles like Doom 3 are, as awaited, not a big challenge for the Acer Aspire 5536G. As expected, this game ran smoothly also with a high resolution and ultra details with 45 fps. 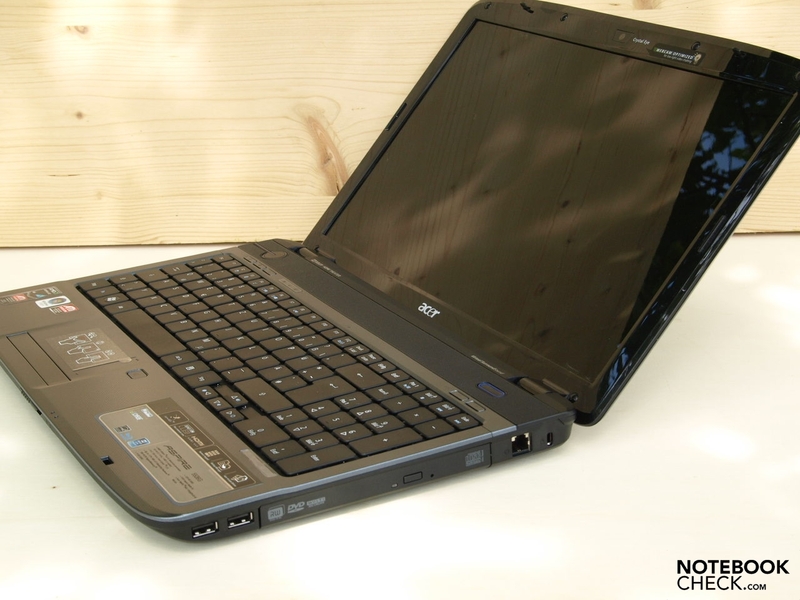 We also put the Aspire 5536G to a further practical gaming test with the popular shooter Call of Duty 4. If you choose the minimum resolution of 800x600 pixels and low details, the system very well achieves a playable range with an average of 63.4 frames per second. However, if you increase the resolution to 1024x768 pixels and medium details, it already gets tight in view of performance with an average of 28.44 frames per second and you cannot count on continuous gaming fun, anymore. We also ran Crysis on the device for testing purposes. 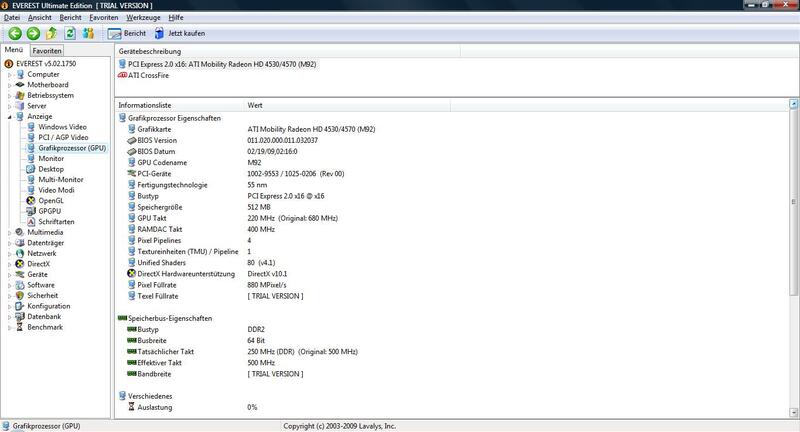 The Acer Aspire 5536G with the ATI Mobility Radeon HD 4570 achieved 41.36 fps (three run throughs, best value) at a resolution of 1024x786 pixels and low details in the GPU benchmark test. Merely an average of 22.66 fps are still possible at the same resolution but medium details. Resolution 800x600, all minimum/off, 0xAA, bilin. Resolution 1024x768, all medium/on, 2xAA, bilin. 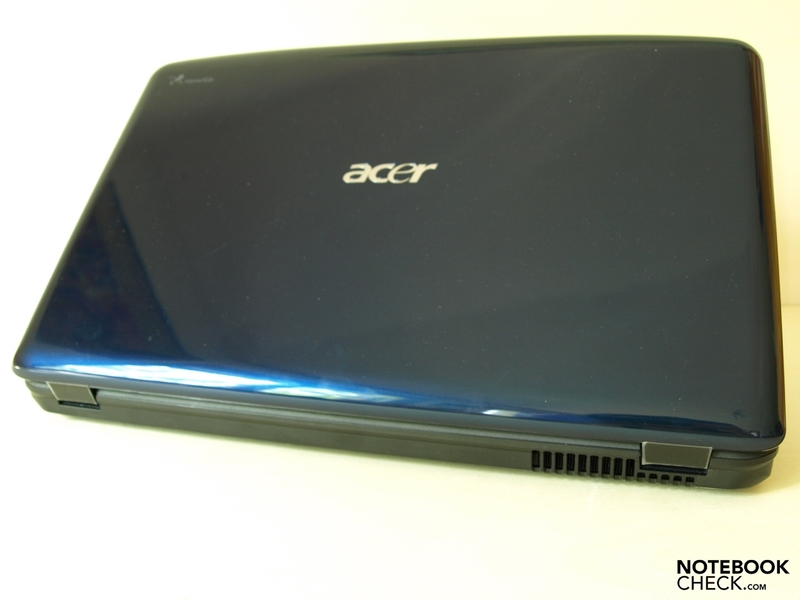 A constantly running fan could also be observed in the Acer Aspire 5536G at use without and at low load, hence at office mode while surfing in the internet or even in idle mode. This can be described as very audible with a volume of 36.4 dB(A) on our measuring scale, but can still be dealt with due to its pitch. The notebook remains on this level also in classic office applications. 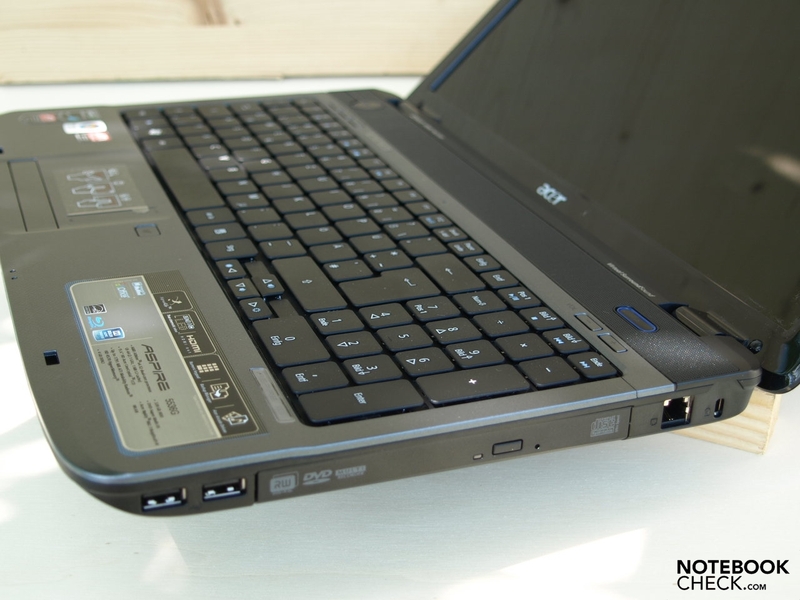 The Acer Aspire 5536G reaches its maximum volume of 42.6 dB(A) under load very quickly. This noise level can sometimes already be called loud. This will be more or less noticeable depending on the application, for instance when your interest is captivated elsewhere in gaming. The left to center upper side becomes noticeably warmer under load. The heating becomes very noticeable for the left hand at typing or controlling games via A-W-S-D with observed maximum values of up to 41.8 degrees Celsius. A maximum value of 57.6 degrees Celcius was measured on the bottom side in the left back section It even becomes subjectively noticeably hot in the area of the louver. (±) The maximum temperature on the upper side is 41.8 °C / 107 F, compared to the average of 36.5 °C / 98 F, ranging from 21.1 to 71 °C for the class Multimedia. (-) The average temperature of the palmrest area of similar devices was 29.1 °C / 84.4 F (-9 °C / -16.2 F). 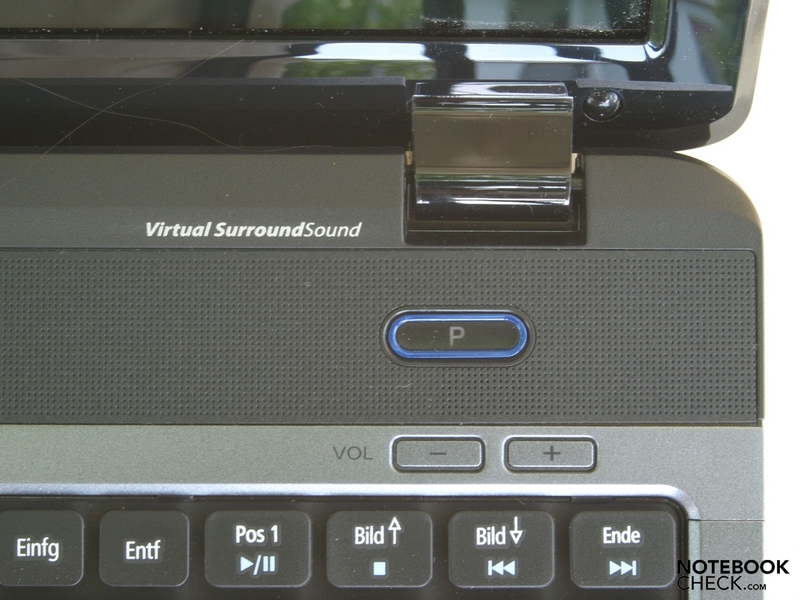 Both built-in loudspeakers have a very dominant place over the keyboard. The integrated Dolby-optimized surround sound system becomes worth its money, to an extent. The sound is definitely sufficient for multimedia applications, even if lacking some bass. The maximum volume is also alright. An overdrive can sometimes be noticed at maximum volume, though. Note: the battery life is dependent on the single configuration. 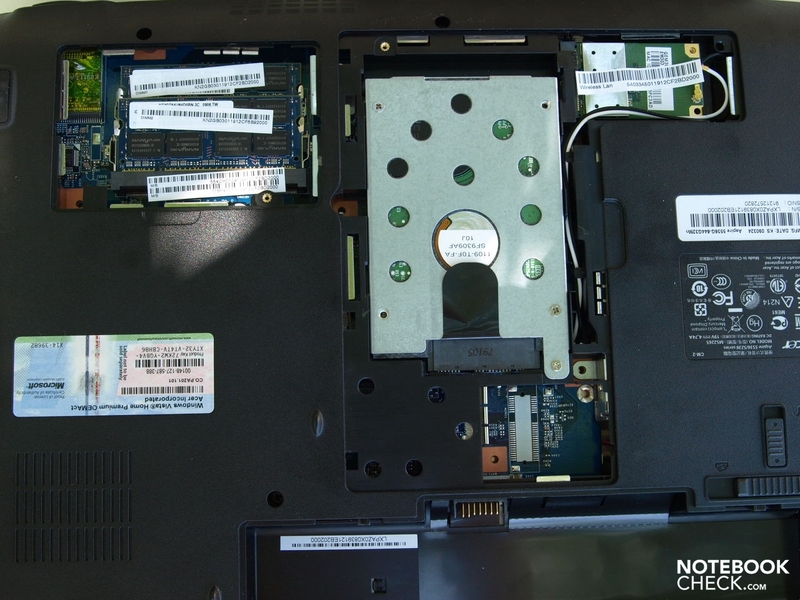 Because the Acer Aspire 5536G is also available with other components, the measuring results can vary accordingly. In the BatteryEater Reader's test, representative for the maximum possible battery runtime to be awaited at minimal display brightness, deactivated WLAN in Windows energy savings profile, the test device reached 167 minutes, hence just 2 hours and 47 minutes. A dramatical runtime cave in is to be noted under load. In the BatteryEater Classic test (load, max. display brightness, WLAN on, high-performance profile) the runtime sinks to merely 47 minutes and therefore barely has relevance for the practical test. A runtime of approx. 121 minutes can be counted with in practical surf mode at maximum display brightness and activated energy savings mode. With this, merely around 2 working hours are possible without an external power source. 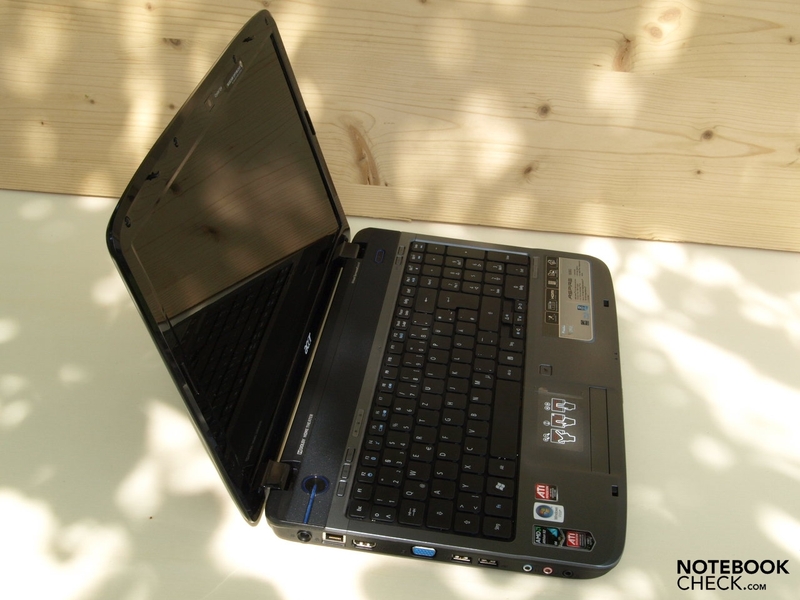 70 minutes were established at watching a DVD movie - but at maximum brightness and high-performance profile. The battery life is definitely too short for a one and a half hour movie. Decreasing the brightness might just extract a few additional minutes. 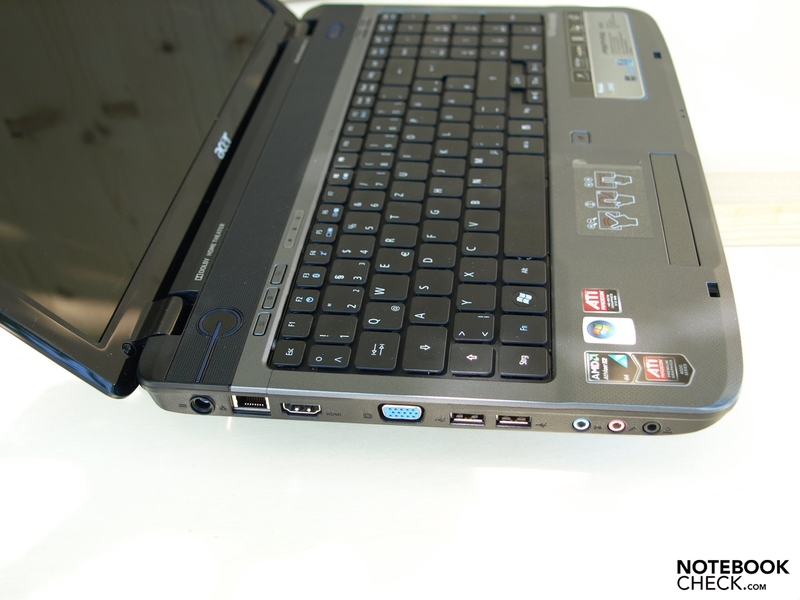 The Acer Aspire 5536G-644G31Mn positions itself as a low-priced multimedia starter device. 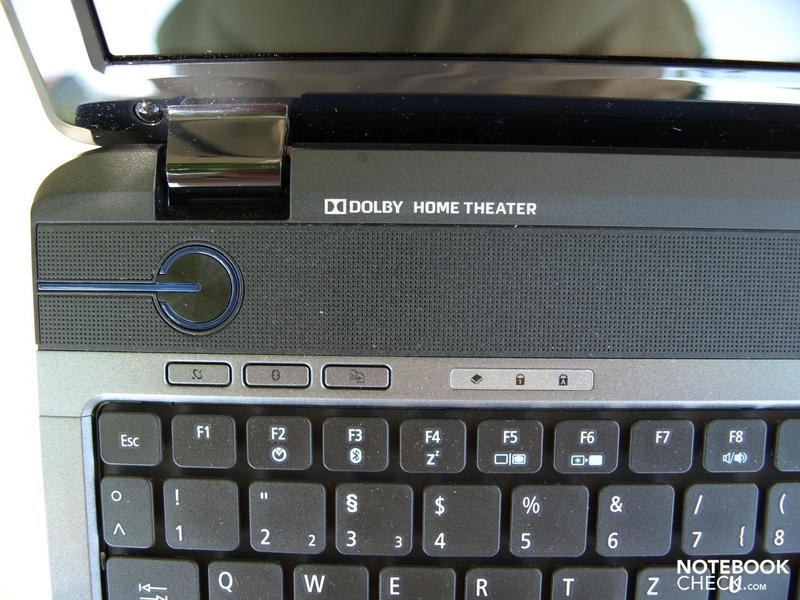 It tries to score with an HDMI connection, DVD drive (alternately, but not integrated into the test device, also with BluRay drive), and a sound system optimized for Dolby surround sound. 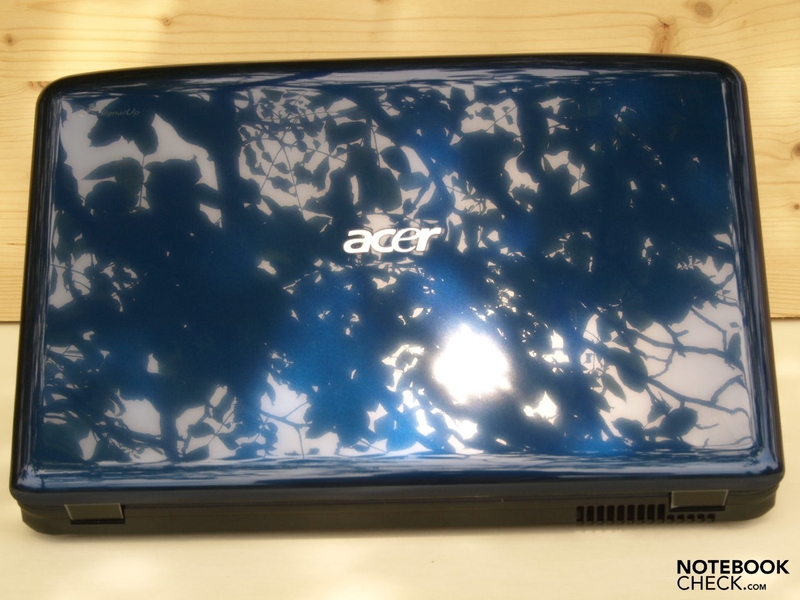 A 15.6 inch case in Acer's Gemstone design with a Safire Blue high-gloss display lid serves as the base. The notebook's design is impressive, even if the large, blue-lit power button seems somewhat too obtrusive. The case's stability and workmanship did pleasantly surprise us in view of material selection. A significant stumbling block for the device's mobile use is the short battery life, which is tightly measured with a maximum of up to 2 hours. The display with its glossy surface doesn't add to the device's mobility, either. Outdoor missions are definitely not to be recommended due to permanently noticeable disturbing reflections at adverse light conditions in use. 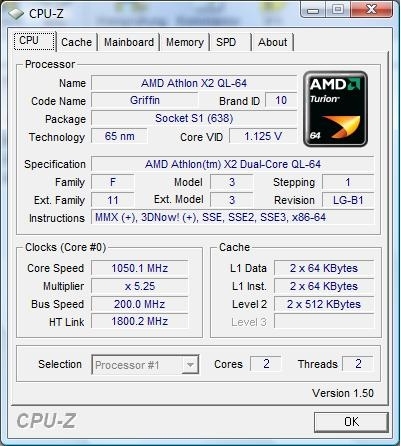 The combination of an AMD Athlon X2 QL-64 CPU and an ATI Radeon HD 4570 graphic card is good for the wallet and makes a smooth notebook use for daily applications possible. The hardware finds its limits of performance quickly in computing intensive programs. Light multimedia fare at stationary use can be specified as the application field for the Acer Aspire 5530G. This ranges from DVD rendering and maybe BluRays, if this option has been selected, to less demanding computer games. In view of configuration, the pricing is very fair. 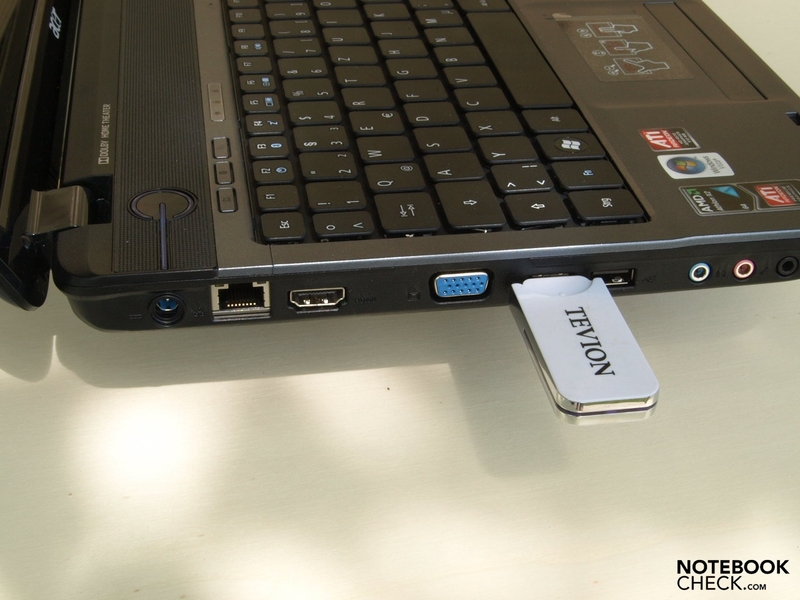 One thing's for sure: You shouldn't be using broad USB sticks for this device. You could optionally block the optical drive. In any case, both USB 2.0 ports on the right are, unfortunately for righties, also far front. The keyboard has a separate numerical block, at expense of the key size. A further bonus for this keyboard is the given standard layout and a pleasant type feel. The Acer Aspire 5536G is, in order to keep the price low, based on AMD and has, aside from a M780G chip set, an ATI Mobility Radeon HD 4570 graphic card, which is a multimedia capable graphic from the starter's range with good performance data. Windows Vista Home Premium 32 Bit version is preinstalled as the operating system, but a recovery DVD isn't included. 4 gigabytes main memory is standardly preinstalled. This can be easily upgraded over the maintenance cover, for those whom this is not enough. The port placement is more or less suitable, depending on the planned mission. The keys lettered "+" and "-" control the volume. Muting is only possible with the Fn+F8 key combination. ...not last due to the anthracite colored wrist rest, an elegant impression. The sole brake of the otherwise high-quality plastic case is the restricted opening angle. 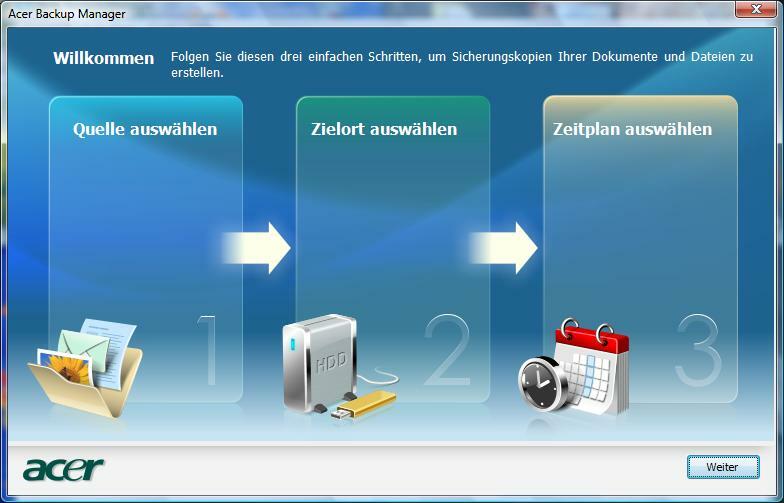 and finally for the Acer Backup Manager, which makes a comfortable system backup possible. 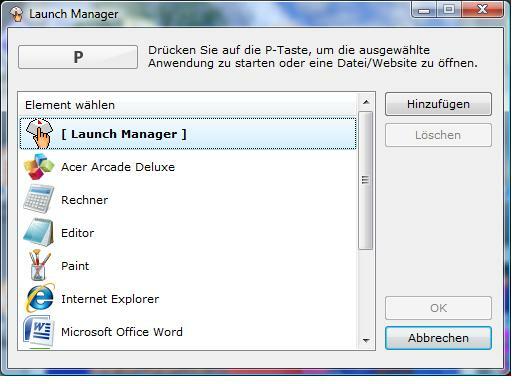 ...which can be defined with the Launch Manager. Last but not least, the 16:9 screen format should make a bar-free movie experience at home possible. An optimized dolby-surround-sound sound system provides for an adequately appealing, but lacking bass, sound experience. to the WLAN module is just as easy. Despite massive use of plastic, the good case stability and the lever directly beside the touchpad for activating and deactivating this. Definitely a longer battery life. The total orientation on movie rendering, which is also reflected in the 16:9 display format - is this really the notebook's only mission, or wouldn't somewhat more vertical place be quite useful for other applications? More expensive candidates would be the stronger Acer Aspire 5935G (with Intel Core 2 Duo CPU and a hybrid graphic solution) or with an even better 3D performance the mySN MG6 Notebook (Compal HLB2), which would rather be seen as a starter's gaming notebook and is therefore accordingly more expensive.